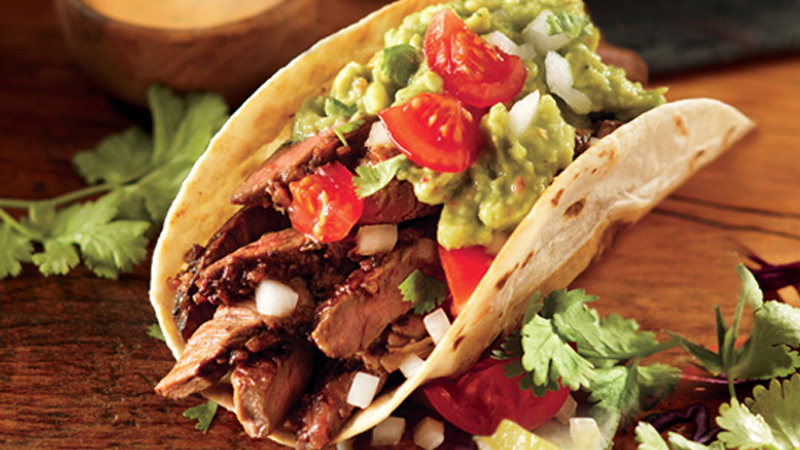 Treat your family to restaurant-style steak tacos tonight. Place the guacamole seasoning (from the soft taco kit) into a small bowl and stir in the mashed avocado. Cover the surface closely with cling film and chill in the fridge. Mix the beef seasoning (from the soft taco kit) in a shallow bowl with the water, lime juice and 1 tablespoon of the oil. Dip the whole steaks (unsliced) into the mixture and turn to coat. Heat a large cast-iron griddle pan over a high heat. Brush the surface of the pan with the rest of the oil. Place the steaks in the pan and cook for 2-3 minutes on each side until charred in places. Remove from the pan, cover and leave to rest for 5 minutes. Transfer the steak to a chopping board and cut across the grain into thin strips. If you prefer your steak well done, return the strips to the pan and cook for a further 1-2 minutes over a medium-high heat. Remove the tortillas for the dinner kit and heat as directed on the packaging. Pile the hot steak strips and any pan juices into the tortillas and spoon the chilled guacamole on top. Serve topped with the tomato, onion and coriander and with lime wedges to squeeze. For a flavour boost, let the steaks marinate in the lime juice mixture for 30 minutes in the fridge before cooking. Other steak cuts will work just as well – try juicy rib-eye or lean and tender fillet.